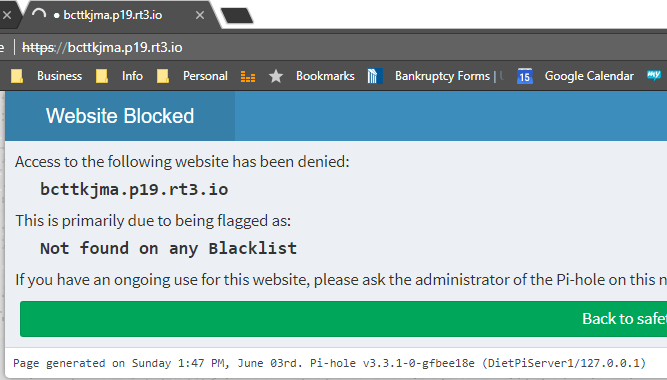 I’ve tried whitelisting hotmail.com and www.hotmail.com, both via the web interface and using the pihole -w command (after removing them from the web interface whitelist and rebooting), but it keeps popping up… Sometimes, not every time. After whitelisting the pages via pihole -w the error page does state “This site has been whitelisted, please flush your DNS cache and/or restart your browser”. i’ve done all these things but the PiHole keeps giving the same messages. However, sometimes it just redirects you to outlook.live.com, but it looks almost random…I’ve also whitelisted outlook.live.com but since it states on the pihole page that www.hotmail.com or hotmail.com have been blocked, I don’t think that will make any difference. Did you recently whitelist a domain, and did you flush the DNS cache? I disable Windows DNS caching. While I have added a few items to the whitelist (in my troubleshooting), it’s been quite some time (perhaps 30 minutes). I’ve even restarted DNSmasq from the web menu. Some browsers (Chrome included) cache DNS queries, so you should clear their cache as well. What is the output of nslookup bcttkjma.p19.rt3.io on both the Pi-hole and Windows machine?